"David. Vita, morte e miracoli"
For this exhibition, Tuscan artist David Casini, utilizes one of the most famous symbols of Florence as the basis for his work at the SRISA Gallery located on the campus of the Santa Reparata International School of Art. The work is that of Michelangelo’s David, housed only blocks away from SRISA in the Gallery of the Accademia of Florence, the same school where David studied. 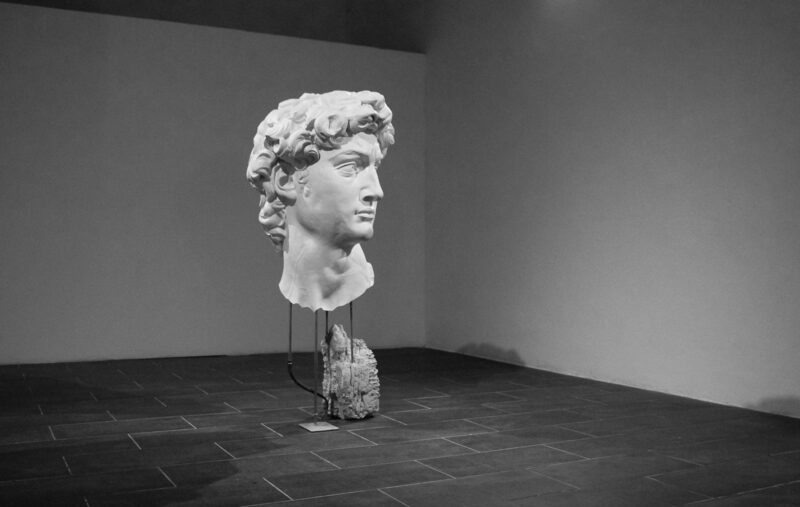 They share the same name, and the title of the exhibition “David. Life, death and miracles” plays on this ambivalence. Each work functions separately while at the same time embodying a synthesis of the artist’s artistic path. Life, death and miracles; fervor, oblivion, and fortune. The head of the David, a masterpiece of perfection, is emblematic of an immediate recognized artistic success. It is celebrated in Casini’s work, albeit somewhat denatured and reinterpreted through a composition that exemplifies the fragile equilibrium between such different elements that open the work up to an interpretation that can move forward and back in time.